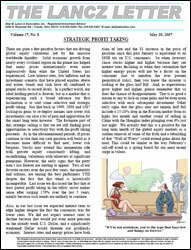 The Lancz Letter has become one of the most highly regarded investment newsletters within its industry. What began as an internal update of investment changes for our clientele, The Lancz Letter soon caught the attention of sophisticated investors throughout the world. Today, it has been quoted in almost all leading financial publications like USA Today, The Wall Street Journal, CNN "Moneyline" and "The Nightly Business Report" and continues to be quoted regularly in many other leading national news media. The Lancz Letter reflects the diversification of our investments. It gives current recommendations and analysis on stocks, bonds, real estate, currencies, and other related investment vehicles. It focuses on some of the same money management activities that have made Alan B. Lancz such a success over the past 25 years. Purchase by By Phone Contact LanczGlobal.com Membership Services @ 1-888-275-4225. Last issue, we mentioned that the NASDAQ decline was not over and the last few weeks have not let us down. Our words of warning throughout the past year regarding the dot-com bubble and how when it burst it would definitely have an impact on the overall market has come to pass. Many investors are finally learning that just because a $4 stock was $104 a few months ago does not mean it is a bargain. In fact, 135 dot-com companies have declared bankruptcy this year alone and no matter how low investors purchased these companies they are now facing 100% loss of their money. In the midst of this turmoil in most high tech stocks, it is amazing to us that so many of our recent recommendations are doing exceedingly well. In fact between our S&P 500 "Alternative" Portfolio and Special Situation "High Income" Portfolio all of our positions are up in price since our last issue with the exception of Tribune Company. A remarkable 11 out of 12 positions were up in price during the same period the NASDAQ has experienced double digit percentage losses. Our Blue Chip Portfolio has had six out of eight positions up in price, with the two losers only down slightly in price. We owe much of this success to our strategy of buying the depressed pharmaceuticals nine months ago when Wall Street was forcing even the high quality leaders to new lows. Other contributing factors to this success has been our selectivity in regards to the companies we buy. In fact, the few tech stocks that we recommended before the downturn have even dramatically outperformed. Avid Technology recommended in July is up nearly 80% for us through yesterday, J.D. Edwards has doubled for us since its lows of seven months ago and Tellabs a very recent September recommendation has soared 29% during the worst part of the high tech sell-off. This is not even including old favorites like NCR which have been hitting new highs each week for us despite the high tech turmoil. The third factor that has helped us during this very volatile year has been our disciplined approach of taking profits on our better performers and re-deploying proceeds into new depressed bargain areas. This was critical nine months ago when we were taking profits in the high flying biotechs at the same time we picked up Merck, Elan, Warner Lambert, Johnson & Johnson and Eli Lilly all near their lows (they are all now approaching all time highs). Even last week, we were able to lock-in some profits in Genzyme General at all time highs near $90 (a stock we were buying less than one year ago at $35 1/2), Seagate Technology at an all time in the mid-to-upper seventies after buying it earlier this year at almost half that price, and XOMA a more speculative biotech that had huge buyers to which we sold much of our holdings last week around $15 after trading at less than half that price only months ago. This week we are locking in profits on SBC Communications (now that it is at new highs up over 60% from where we were buying it early this year) and Verizon Communications which has also severely outperformed a battered telecom sector. We are not locking in these substantial gains because we do not like these two quality leaders but rather because their peers are now so much better values (similar to the drugs having more appeal nine months ago at their lows particularly when compared to the high flying biotechs). The main culprit to this current NASDAQ plunge is simply that investors were far too concentrated in high tech - to a point where investors only looked at the potential upside (which was over exaggerated by Wall Street) and never really ascertained their risk. Momentum buyers, mutual fund companies and margin accounts were all contributions to this problem by continually adding fuel (i.e., new monies, more tech funds, greater margin buying power) to the overvalued fire. In crisis there is always opportunity and it is not just coincidence that a good part of our Blue Chip Portfolio holdings are pharmaceuticals (even though this may be a good time to lock-in gains in that now high flying sector), while our Aggressive Growth Portfolio now has a new distinct high tech flavor. It is still very critical to be select and only focus on the high quality leaders from here. Two quality leaders have been added to our Aggressive Growth Portfolio - this may be the best place to start picking up some long term bargains. The Dollar has had a particularly strong two years versus most major currencies, thus continuing its long term uptrend. The strong gains since October 1998 need to be digested with some slightly lower to flat movement for the foreseeable future. We do not expect any worthy progress in terms of the Dollar until well into the new year. There are a number of reasons why Alan Greenspan will be looking at lowering rates early next year. First of all the Fed Chairman has eradicated the "irrational exuberance" that was so much of his focus the past two years. The dot-com phenomenon, one of the biggest bubbles in the stock market history, will now become a historical note that future investors can look back on and learn from. This sudden reversal of the wealth effect, along with substantially higher energy costs, will slow down GDP dramatically, thus forcing Greenspan to lower rates and this is one of the main reasons we are starting to buy select stocks here. Now that the dot-com bubble has finally burst, many investors have panicked or been forced to reduce positions. While the repercussions of this will be felt by most technology stocks, much of this is already discounted in many of their stock prices. It remains critical to focus on only the high quality companies, because under a slowing economy the industry leaders will be the only ones to really prosper. Two years ago, on the brink of our third consecutive unusually warm winter, we recommended buying the leading energy stocks feeling the experts call of $10 a barrel oil was overly pessimistic. The exact opposite is true today with the experts too positive regarding the continuing rise of energy prices. An early cold spell falls in line with this sentiment, but further rises will be temporary - as higher energy prices are unsustainable over the intermediate or long term. Lower interest rates early into the new year will push bond prices higher and that is the primary reason we have increased our bond exposure of late. We do not expect huge gains and any additional appreciation (from a flow of monies into defensive plays) may be considered an opportune time for some profit taking. We were on the West Coast earlier this month meeting with several popular money managers and have come to some interesting conclusions after our discussions. First of all, it seems to me many of these managers were smitten with tech and are still very vulnerable to future losses. Many of these tech stars, such as Kevin Landis of Firsthand Funds, are very knowledgeable in the tech world but in the world of money management, true expertise may be lacking. In the world of money management it is imperative to have one's priorities in order and it seems many of these managers are geared more for increasing asset growth through publicity (and getting new accounts) rather than focusing on the primary directive of growing existing assets and making current shareholders' money grow. Sometimes ego gets involved in the competitive world of money management and when you see a mutual fund manager on television more than actually managing your money, then it may be time to reassess your holdings. Bob Sanborn, former manager of the Oakmark Fund, discovered the importance of time management and setting priorities right. After being labeled the best money manager in the country by Barron's five years ago, he dramatically underperformed for the next four years. Part of the problem may have been the toll numerous interviews and media exposure took from his daily routine, very similar to what also charismatic, Landis has experienced with the past 12 months. It seems excellent communication skills and strong personalities are rare finds and precious commodities in the financial world. We coordinated a disciplined amount of time with the media in the late 80's and early 1990's. After establishing ourselves in the national spotlight we dramatically limited our media exposure (only because we felt spending the vast majority of our time on research would be the area our clients want us to solely focus). In comparison, one major mutual fund family has actually built a studio at shareholders expense - to better opportune themselves to being regulars on CNBC, CNN and Bloomberg. When I asked Landis how he can afford so much time (nearly everyday) on these financial networks he said that since the NBC affiliate is across the street from his office it really did not take that much time from each day. The last time we were on CNBC was in May of last year after Jill Barad, formerly the CEO of Mattel, was dismissed. Her severance package was extraordinary and every analyst was jumping on that fact, and downgrading the stock even at $10-12 a share. The only reason CNBC asked us to go on the air was because they could not find any other professional that was buying Mattel stock at those depressed levels. It was easy to jump on the bandwagon and expound on the negatives of Mattel's termination package with Ms. Barad, but in actuality the company was doing the right thing to get rid of her. Her skills in building the Barbie franchise did not assimilate into the acquisition front and she severely hurt the company by overpaying on some strategic acquisitions. The stock at $10-12 a share represented good value and after the mistake of Barad the board brought in former top executive at Kraft, Bob Eckert, who could better monetize Mattel's leadership assets. By the way, our CNBC interview was done in less than 15 minutes with the local NBC affiliate in Toledo coming to my office for filming with the audio done via the telephone. We would not have even done it except for the fact that CNBC could not find anyone else with an opposing view of Mattel's stock at the time. So the next time you continually see the same money manager on these financial shows ask yourself if you would rather have them actually at their office watching over your money. If the U.S. Stock Market continues to decline we may actually see Greenspan lower rates before the next Fed meeting in March. Otherwise, expect another 50 basis point cut next month to start helping the economy get back on track. The Euro has rebounded strongly from its lows, as the Dollar appreciated versus the Euro much more than we expected during the majority of last year. We see further strength as rates in the U.S. decline faster than most of Europe, while Japan will continue with its financial woes. Once again the consensus is sold on their theory that the first half of the year will be difficult and in the second half the economy (as well as the stock market) will see a strong rebound. Every money manager we met with two weeks ago was saying this and we think it helps settle their investors (shareholders) down after seeing their huge losses of late. In reality, we do not feel the economy, or the tech arena, will turn around so quickly. After all Michael Dell would not have laid off his first employees in his company's history if he thought by June/July we would be experiencing a lightning turnaround as the pundits expect. There are still ways to make money in this market, it will just take a disciplined attitude that takes advantage of the herd instincts of most investors. The best case in point is Cabot Corp. which we listed last issue. This "real" company has already surged 42% as investors look for real assets, cash flow and value. Obviously with lower rates still in the cards, bonds should continue to do well throughout the first half of 2001. After that, it will depend on if this, along with the proposed tax cut, re-starts the U.S. economy. Most of the gains in bonds have already been established. One reason we feel the decline in markets may not be totally over is the continued new accounts we see coming in with major losses. The popularity of our publication services also tells us that investors are seeking real research and getting tired of the losses at major brokerage firms whose analysts are masters of "predicting the recent past." Q: Your call on Member's Only to sell into the high tech rally before the Cisco earnings release was right on target. It once again shows the value of daily updates on your Member's Only site. How did you know Cisco was to report bad numbers that surprised the street that would devastate the entire high tech sector? A:	No one knew for sure, but all indicators that our research led us to believe the company would not only disappoint, but probably more so than what CEO Chambers indicated just weeks earlier. We are more proud of the fact that another recommendation, Xircom, that was also featured in The Lancz Letter, only five months ago is being taken over at a huge premium for us. This marks more than a dozen recent takeovers and illustrates that there are still ways to make money in a depressed tech environment. This year it will be more important than ever to be in the right areas of the market and in the case of tech to tread carefully. © LanczGlobal, LLC. 2017 All rights reserved.